In my humble opinion, this is the best general Japanese-English dictionary for learners of approximately beginner to intermediate level. You can use it with just kana knowledge. It will take you a long way. More advanced learners will want something more substantial (see below), but the Kodansha dictionary is a good start. 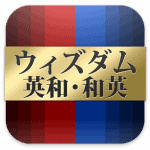 I have been using the Wisdom Japanese-English Dictionary app for years now. It has a ton of entries, clear definitions and great example sentences. In particular, the examples come in handy for learning new terms and helping them stick. It will cost you a little bit of upfront investment, but I really rate this dictionary for study purposes. You can read my full review of the Wisdom Dictonary here. When I’m working at the PC, my first point of reference is now Linguee’s Japanese-English dictionary. It has an incredible number of example sentences (sourced from actual bilingual texts) for any given term that provide a deeper context than your average dictionary. The only caveat is that not all of the translations are 100% reliable so you need to have some grounding and experience in the language to suss out any possible duds. ALC is a well-known publisher of language-related materials in Japan. They also provide a great online dictionary with a lot of example sentences. This used to be my main tool until Linguee came along. Kotobank is another useful dictionary. I generally use it for quick lookup and for Japanese-Japanese definitions when I want to know a more exact meaning of a term. It is formerly known as the Yahoo Japanese-English Dictionary. I find the Proz.com archives extremely useful when I’m doing Japanese-English translation. I generally use the lookup feature for technical terms or those of an otherwise specialised nature. 5 stars! Last but not least (!) is the Perapera Japanese Popup Dictionary provided by yours truly. If you enjoy using our plugin, please consider donating to fund updates and further development! So there you have it. I encourage you to check out the dictionaries that I mentioned here and see which one best fits your situation. If you are still a beginner, one solid dictionary such as Kodansha should be sufficient for starting out. You can always diversify your collection at a later stage. What are your favourite Japanese lookup resources? Am I missing anything here? Let me know in the comments below! It took me a long time to find it, but I find the “Japanese” app to be the best (and free) Japanese-English dictionary. For those who know it, it’s very close to the Pleco Chinese-English dictionary app. Seems there’s more functions on iPhone than Android, as a friend on Apple could also draw kanjis for lookup, and I can’t on Android. Gotta say I used his website only up until I installed my fave Popup dictionnary addon, though !